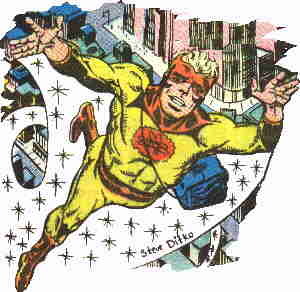 nuclear-powered superhero debuted in Charlton Comics' Space Adventures #33 (March, 1960), in a story written by Joe Gill (Gorgo) and drawn by Ditko. Captain Adam was an officer in the pre-Vietnam U.S. Air Force, stationed at Cape Canaveral, when he had one of those comic book accidents that would disintegrate an actual human, and — surprise — was disintegrated. Where he departed from reality was in being able to pull himself back together; and when he did, he found he had wonderful and very useful super powers. Thereafter, he served his country both as a military man during the height of the Cold War — and as Captain Atom. His run was brief. Within a year and a half, Ditko left Charlton to work full-time for Marvel Comics. One Captain Atom story was illustrated by Rocke Mastroserio (Gunmaster, Nature Boy), then the character was allowed to fade away — it was the Ditko touch that gave it its charm. Space Adventures went back to a steady diet of non-series science fiction stories. A few years later, Charlton made a major move into superheroes, and brought him back. His adventures were reprinted, starting in Strange Suspense Stories #75 (June, 1965). A few months later, the reprints were swapped out for new stories, and Captain Atom took over the whole comic — drawn by Ditko, who had by then left Marvel. Again, his run was brief. Charlton's superheroes didn't catch on, and the publisher pulled the plug on them in 1967. Since then, this version of Captain Atom has been seen only in occasional reprints — usually so badly printed, you can't see how good Ditko's art was. In the 1980s, Charlton's superhero properties were bought by DC Comics, which used Captain Atom two different ways. First, they revamped the character from the ground up, and introduced a Captain Atom of their own in 1986. Second, they used him as the basis for Dr. Manhattan, a major character in Watchmen. In any of his forms, Captain Atom is not a licensing bonanza or a hot property. His main point of interest is that he's an obscure little Cold War character who just happens to be Steve Ditko's first superhero. Text ©2000-09 Donald D. Markstein. Art © Charlton Comics.